From Las Vegas we headed north-east towards southern Utah. Our destination? Zion National Park. We had originally wanted to see both Zion and Bryce Canyon, but there was never going be enough time, so S cast the deciding vote and we went only to Zion. We were not disappointed. After what felt like an endless drive through seemingly featureless landscapes (although we did pas a rather large sand dune at one point, I think…) we finally reached our destination. Having researched the park only enough to make our decision to visit, we weren’t really sure what to expect. Well, I can tell you one thing for certain – Zion National Park is a wonderful, beautiful place. The road that winds through the valley is no longer accessible by private vehicle, but the park runs an excellent bus which circles the route very frequently. It stops often which gives you a chance to hop-on-hop-off and explore the surrounding areas. An outdoorsy person would be seriously spoilt for choice at Zion. The hiking and rock -climbing opportunities are endless. We, well, we stayed on the bus until it reached its terminus and only then did we get off. At the end of the bus line there’s an extremely accessible and peaceful mile-long walk along the green waters of the Virgin River. We took our time wandering the path, which was quite crowded considering the early hour. For reasons known only to themselves there was a group of older tourists there who were obsessed with taking pictures of squirrels. Honestly. Here you are in a canyon of absolutely stunning natural beauty and you’re taking pictures of the…squirrels? Yeah, ok…. Beautiful, beautiful, wish you were here! It really was phenomenally beautiful. Quiet and peaceful, despite the fact that it was quite busy. Again, it’s interesting to imagine the very first person who ever encountered these canyons…it would certainly fuel belief in a higher power, that’s all I’m saying. When we returned to our car we headed straight back onto the road. 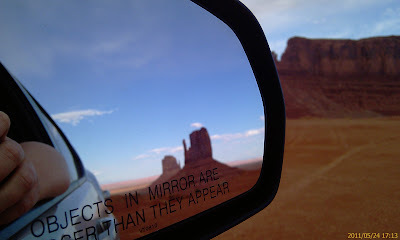 This was one of the longest driving days of the entire trip – but there was no way I was going to come to Southern Utah and not go to Monument Valley. I mean, really, who does that? So we drove and we drove and we drove. The scenery does not change much in this part of the world, I’m afraid. The view from the window was either the backside of an 18-wheeler (if I was driving) or the horizon stretched out interminably (if S was driving). It was the very essence of a Road Trip – and I enjoyed every single mile of the journey. 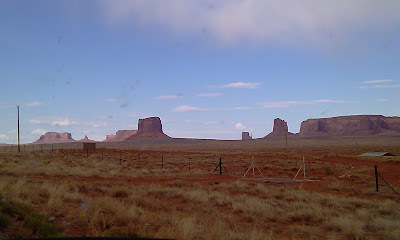 Our plan was to arrive in Monument Valley in time to wander the monoliths in the settling dusk, then spend the night camped nearby. However, I am sorry to report that the only camping in the area was certainly not suitable for us. There was no running water or toilet facilities, no place to cook or anywhere to make a fire. If you add onto this the fact that there was a very, very strong wind that evening, you have all the information which fuelled our decision to power on through to Flagstaff, AZ after our brief, but no less wondrous visit. Like I said, it was one of the heaviest driving days of the entire three week journey. However, having said that, it was entirely worth every extra mile and every cent spent on the gasoline which took us there. It is a hushed, silent and scared place. Totally awe-inspiring. Iconic and unforgettable. We stayed for a very long time just looking. On our last day (apart from the flight home) we drove from Geneva over the Alps to Turin. We knew the only way to go was through the Mont Blanc tunnel and we were very excited about it! Imagine driving 7.25 miles through solid rock. Awesome, right? Well, it went by pretty quickly. I tried not to pay attention. On the French side of the tunnel we wanted to stop and take some scenic pictures, so we pulled off at the first turning. Small town called Courmayeur. Well, they had a gondola ride thingy where you could go up the mountain. So we bought tickets, just to see how scared I would get riding up in the tiny, dangling box. We had no idea it went all the way to the top. Let me say that again. It went all the way to the top. 11,371 feet up. This is where I stop talking. Do you see the glacier? The smallish, triangular peak in the middle distance is the Matterhorn. I could go on and on, but I won’t bore you. It really is something you need to see in person. We stayed up there for four hours. It was amazing and awesome and an absolute must see. Go there. Seriously. Or, just go HERE and look at the rest of our pictures. After we travelled back down the mountain (by the way, I don’t like heights and I did NOT like this journey!!) we drove onwards to Italy and Turin, where we were staying the night. Now, I am going to try to make this brief as well. I LOVED Turin. It was my favourite stop on our tour, I liked it better than Venice and even better than those mountain views above you. Well, maybe not that last one, but you get the picture. We were there for only a few hours but we got a lot done. We had an excellent map and actually found everything we were looking for quickly. It was already dark when we got there, but my camera takes great pictures in the dark, which is lucky! We saw museums, palaces, churches, all by the light of the moon. All of our pictures can be found HERE. My favourite part of the city was the original Roman city wall and gate. If you know me at all you know I am a sucker for Roman history, monuments and the like. This was like accidentally walking into a dream. Honestly, I pranced around for a good half hour touching bricks and going, “Look how old this is! How long it has been here!!”. S gave up on me and wandered off on his own after a while. I must have walked in and out the gate five or six times pretending I was a chariot. Why a chariot, you ask? Because you could see the chariot wheel marks in the stones on the ground. Maybe not chariot wheels, but wheels of some kind, anyway. See? As usual, the rest of our Turin photos can be found HERE. Well, it may have taken a long time for me to get here, but that is the end of our trip to Europe. I know I have said this before, but I would go back again. I would go back again tomorrow if I could. We had a great time. We saw everything we wanted to see and more. We drove a long way. We ate a lot of Italian food. My favourites? Venice, Mont Blanc and Turin. Where wouldn’t I go again? Milan or Zurich. So, there you have it folks. Italy, Switzerland and France. Hope you liked it!